Americans are everywhere given the message that they can look up to George Washington, but for those who walk through the Rotunda of the Capitol, the figurative becomes literal. Gazing upward to the dome, one sees Washington floating far overhead, a life-sized and heavenly vision. Constantino Brumidi's "The Apotheosis of George Washington" looms above. The old General and first President sits in majesty, flanked on the right by the Goddess of Liberty and on his left by a winged figure of Fame sounding a trumpet and holding a palm frond aloft in a symbol of victory. Thirteen female figures stand in a semi-circle around Washington, representing the thirteen original states. 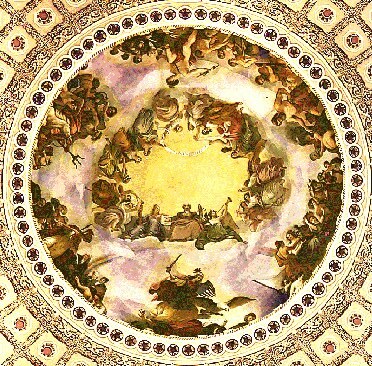 On the outer ring of the canopy, six allegorical groupings surround him, representing classical images of agriculture, arts and sciences, commerce, war, mechanics, and marine. This image of Washington, painted in 1865, reflects a vision of Washington that appealed to the American public just after his death. The "apotheosis" served as a powerful symbol of the immortalization of the country's hero. Paintings and sculptures of Washington's celestial rise were soon to be found in living rooms and civic halls across the country. The religious connotation was clear: here was a man so virtuous and beloved that he surely had ascended to heaven, escorted honorably by classical personifications of freedom and liberty. In effect, the public's civic worship of Washington led to a nearly religious worship just after his death. Washington was suddenly deified. Over the next two centuries, this hero worship of the Father of His Country would take on many forms. After his death, the moral educators of the early 19th century crowned Washington as the ultimate symbol of virtue: an honest mortal worthy of imitation. Once defined as the embodiment of virtue, Washington was able to be appropriated by groups of all stripes. He could be an icon of domestic perfection and almost-aristocratic refinement or the ultimate symbol of the selfless citizen soldier. Politically, socially--and of course, commercially--Washington's image has become an easily-recognized and powerful tool.